for Age of Empires, Rise of Rome, Age of Kings, The Conquerors (including HD), Star Wars Galactic Battlegrounds and Clone Campaigns. This is a program for editing data of genie (DAT and DLL) files. It can edit properties of units, civilizations, technologies, graphics, terrains, sounds, player colors and some other things. Please, ask questions on the forums. Check out this program also. It's for graphical modding. Guide makers et cetera, please include the version into which your guide was written. -Marked resource multiplier as not available in AoE 1. -Adjusted for Age of Empires Definitive Edition. -Internal unit name filter works the way it used to. -Graphics can be filtered by rainbow. -Images are saved centered on hotspot. -Saving an SLP handles player color properly. -Deleting terrain tables uses correct indexes. -Unit terrain table defaults to 0. -Small improvements here and there. -Fixed loading order of DRS files. -Fixed a problem with angle sound count. -Editing box widths are customizable. -Graphic sounds can be heard. -Able to show loose SLP files along with DRS. -Fixed bugs in saving data with enter. -Can save as different game version. -Fixed switching between building and unit icons. -Fixed buttons on terrain tables and borders. -Mirrored graphics with two angles display properly. -Added some helpful buttons to graphics tab. -Deltas with display angle should show properly. -The actual terrain that is drawn is shown when selecting terrains. -Added WASD keys back to SLP view. -SLP view can be zoomed. -Fixed SLP view missing angles. -Show angles dynamically shows exact angles. -Fixed selection bug in armor combo box in effects. -User interface fixes and improvements. -Removed broken batch editing from strings. -Reduced memory usage of combo boxes that share strings. Make your own backups or use the auto-backup feature! Extract to anywhere and run. You may need to run the program as administrator. No help files are included. No mod affects your already saved games, only new games. You may be able to undo changes by going back to the text box and pressing Ctrl + Z. You can have multiple search entries separated with "|" letter. Upper search boxes are inclusive and lower ones exclusive. Use the check boxes to force match all entries. It's me again. :) Since u haven't been replying to my last post I thought I'll ask again. How is it going with the UserPatch 1.5 support? Are you waiting for a stable release to include the new features? As I mentioned before, what I'm talking about can be found on http://userpatch.aiscripters.net/ starting from "Tech Effect Updates". I uploaded some pics to hopefully make more clear what I'm trying to say. The way I understand it, the highlighted stuff is what should be included i.e. It would really be just awesome if you could support that stuff sometime since it would help me a lot in proceeding with my work. I always get a runtime error. Is there a way to get the classic Advanced Genie Editor 2? that never crashed for me. wait did i read this correctly? it works for Age of Empires Definitive Edition? like i can change the technology tree and give assyrians composite bowman? and it works for AoK/TC HD? 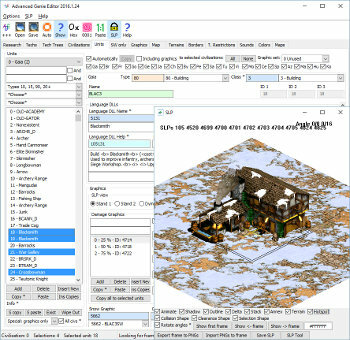 also the age for gaia cannot be changed in aoe by this genie editor - gaia remains in stone age, no resources? Thank you very much for this very nice tool. I have however a question about what seems to be a strange bug. What I'm trying to do is to show damage graphics for units. In other words, I would like a unit (for instance, an archer) to have different graphics depending on his damage level. To do this, I first tried to copy/paste the damage graphics from a building (for instance, an outpost) to my archer. This first step worked very well, my archer had flames around him when his health decreased, just like an outpost. I then tried to replace the flames graphics by another self-made graphic (a circle filled with different color depending on the health level). I managed to create a new SLP with my own graphic and to import it, with TurtlePack. When I assign this new graphic to the archer in AGE, everything seems fine in AGE (the new graphic appears correctly in the SLP window): however, the graphics change does not seem to reflect in the game, which is still stuck to the initial graphics (the outposts flames). In other words, the damage graphics shown in the SLP window in AGE do not match with the damage graphics in the game, which is quite annoying. Do you have any idea why this happens and how to fix it ? Edit : I found the bug, the box "Including graphics to selected civilizations" was not checked. With this box checked, everything works fine. Hi all, can I do the following with your editor? Does anyone knows where can i find an old version of this ? Hello, I created 3 icons to use the program in an application dock, I also did for the Advanced Genie Editor. If you use it, you do not have to give credits, I'll be happy if you use it.